In order to understand why China engaged in such a massive expansion of coal power investment in the mid-2010s, we investigated key industry policies that have effectively subsidised and (over)incentivised coal power investment. We found that the rules under which China’s coal power industry has historically operated have made excessive investment extremely likely unless the central government serves as a gatekeeper, slowing and limiting investment in the face of incentives for socially excessive entry. However, this ‘gate’ was lifted when authority for coal power project approval was decentralised from the central government to local governments at the end of 2014, which shortened approval time significantly and allowed investment to flood into the market. Two key policies that have distorted the market are guaranteed operation hours and administered wholesale electricity price for coal power generation. Dating back to the 1980s, a central goal of China’s energy policy has been to ensure sufficient power supply to meet the demand that has grown rapidly over the past several decades. 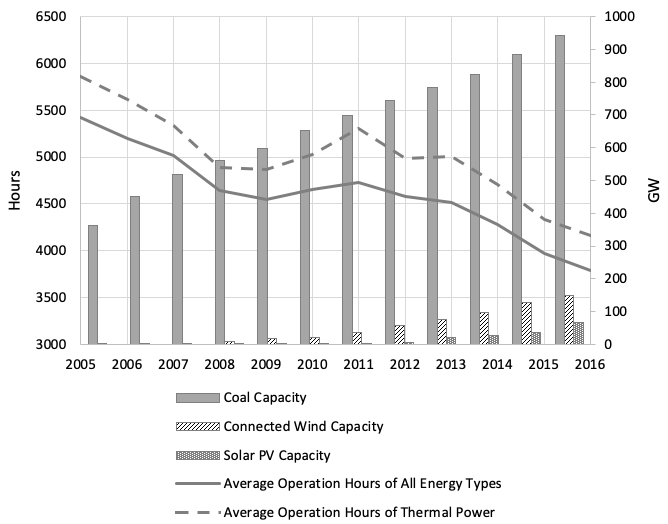 To encourage power investment, the government set relatively equal annual operating hours for all coal-fired power generators and dispatched them based on an annual contract designed to maintain operation hour targets (Kahrl et al. 2013). The rule is known as the ‘average dispatch’ or ‘generation quota system’.2 In economic terms, this allocation rule ensured that demand was equally distributed across producers, creating a significant ‘business-stealing’ effect that induces excessive entry (Mankiw and Whinston 1986). In addition to the guaranteed operation hours, China implemented an effective rate-of-return policy to ensure payback of investment plus a reasonable profit margin for each coal-fired power plant. The policy was slightly reformed in 2003 to become the ‘benchmark on-grid electricity tariff’ mechanism, in which the government set a uniform electricity price within a province for all coal power plants. However, the price that was set continued to guarantee profitable operation for nearly all plants, even older, smaller-scale, less-efficient facilities. With these two policies in place, the coal power generation business in China became almost risk-free. Despite the high incentive to invest, all coal power investment proposals had to go through a stringent project approval process. Prior to November 2014, the central government retained sole authority to approve coal-fired power projects. The approval procedure was often lengthy and costly, sometimes taking years for a project to obtain all the licenses and permits required before construction. However, in November 2014, the approval authority of coal-fired power plants was decentralised from the central government to provincial governments, which considerably simplified the approval procedure and significantly shortened approval time. A sample of 47 projects approved by the central government and 124 projects approved by provincial governments shows that the provincial approvals shortened the average approval process by more than half. From a political economy point of view, this devolution of authority exacerbated the risks of overinvestment. Local officials have been historically evaluated on the basis of the economic growth that took place in the region under their administration. By approving coal projects—even those that threatened to create an oversupply of coal-fired electricity—local officials could realise short-term political benefits from increased economic activity. By the time actual oversupply became apparent, the approving official might have been promoted to a higher position or to another province. This created a bias in favour of approval, even when there was a strong probability that the approved plants would crowd out green energy and reduce utilisation within the fleet of coal plants. In light of these institutional details, we construct a simple economic model that captures the effects of the policies described above on coal power investment and then examine the model’s predictions using coal power project approval records from June 2013 to March 2016.3 We further hypothesise that provinces that already have a relatively large coal mining industry may be more likely to permit the construction of new plants because this will raise demand for another important local industry, boost local economic performance, and hence increase local officials’ likelihood of promotion. Also, large coal-mining industries may have more political power to lobby the government for permission to build more coal power plants. Figure 2 shows monthly average coal production and coal power approvals by province in our dataset. We see that the regional approval rate is much more positively related to coal production after decentralisation than before. Notes: This figure charts monthly coal production and coal power capacity approved by province, before and after decentralisation of approval authority in 2014. We find the approval rate of coal power is about three times higher when the approval authority is decentralised, and provinces with larger coal industries tend to approve more coal power. We estimate that the presence of local coal production explains an additional 54 gigawatts of approved coal power in 2015 (other things equal), which is about a quarter of total approved capacity in that year. While the central government has since taken measures to contain the coal overcapacity crisis, to keep the balance of supply and demand for coal power in equilibrium requires much more than a few action plans and ad hoc administrative orders. When it comes to development of renewable energy and reform of the electricity sector, China is viewed as having very diverse development goals that can come into conflict with one another—including energy security, socio-economic development (developing local industry, providing employment, lessening rural-urban inequalities and consequent migration, etc. ), and environmental protection (García 2011). Effective reconciliation of these conflicting goals will be a necessary but difficult step on the way toward a more socially efficient energy system. Carbon Tracker Initiative (2016), “Chasing the dragon? China’s coal overcapacity crisis and what it means for investors”, Carbon Tracker Initiative. García, C (2011), “Grid-connected renewable energy in China: Policies and institutions under gradualism, developmentalism, and socialism”, Energy Policy 39(12): 8046–8050. Ji, X (2018), “China Reform Institute: Half of thermal power companies face loss, need to increase subsidies imperatively” (original title: 中改院：火电企业亏损近半，需加紧输血造血), Chinareform.org.cn, 4 September. Kahrl, F, J H Williams and J Hu (2013). “The political economy of electricity dispatch reform in China” Energy Policy 53: 361–369. Mankiw, N G, and M D Whinston (1986). “Free entry and social inefficiency”, RAND Journal of Economics 17(1): 48–58. As the government became aware of the overcapacity emerging in coal power generation, it took actions to suspend ongoing projects and prevent further investment, and initiated a new round of reforms to experiment with liberalizationisationof the wholesale electricity market. More policy details can be found in Carbon Tracker Initiative (2016)and Ren et al. (2019). In November 2015, the National Development and Reform Commission NDRC introduced a policy which would no longer guarantee operating hours for coal units built after March 2017. This policy incentivised originators to frontload investments ahead of the March 2017 deadline (Carbon Tracker Initiative,2016). 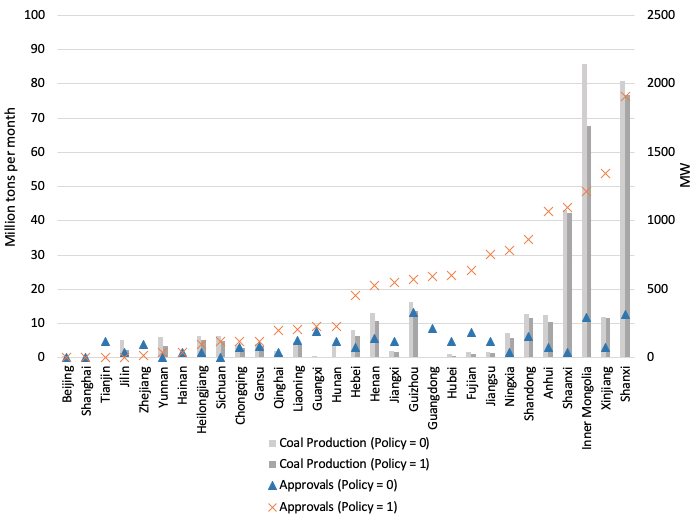 We manually collected a dataset of China’s coal-fired power project “approval records”from June 2013 to March 2016 across 30 provinces and province-level subnational administrative units, excluding Tibet. A total of 313 approved projects were collected from government websites, power companies’ websites, and online news sources.